"This delicious and easy to prepare recipe is sure to be a big hit! Hearty enough for a meal. The key is the meat filling -- it also makes a great filling for tacos and quesadillas. This recipe can be modified to meet your own taste. I recommend serving with sour cream and guacamole. Be creative!" In a 12 inch skillet over medium heat, cook and stir the garlic and white parts of the green onions in canola oil until tender. Mix in shredded chicken, salt and pepper. Toss until well coated with oil. Stir in the salsa. Arrange tortilla chips on a large baking sheet. 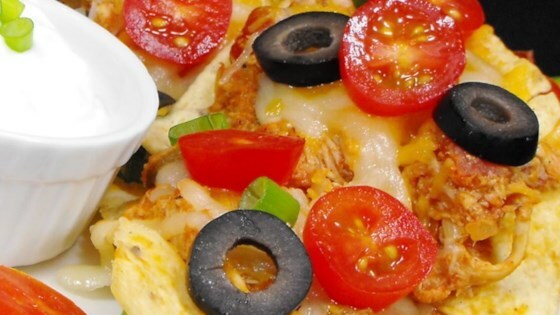 Spoon the chicken mixture over tortilla chips. Top with Cheddar/Monterey Jack cheese blend and tomato. Bake in the preheated oven 10 minutes, or until cheese has melted. Remove from heat and sprinkle with green onion tops before serving. The party just got spicy-delicious!